Antique Light Turquoise Ceramic Bird Bath with 2 Birds | Fountain City Art Ctr. 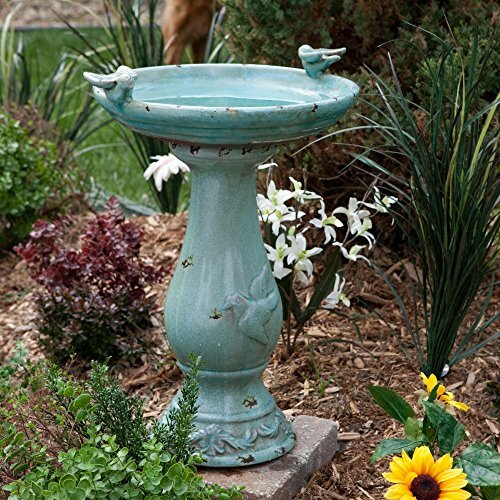 Bring a beautiful and classic touch to your yard with the Antique Light Turquoise Ceramic Bird Bath with 2 Birds. With its antique crackle glaze in gorgeous turquoise and perfect distressing, this ceramic bird bath looks like an heirloom from grandma's garden. It is handcrafted of ceramic and the glaze does double duty as an eye-catching addition to your garden and a protective layer against the elements. Its Victorian design features two sweetly sculpted birds gracing the rim, raised relief detailing at the base, and a curvaceous column. The perfect way to add style and a bird-friendly water feature to your outdoor space. If you have any questions about this product by King Fountain, contact us by completing and submitting the form below. If you are looking for a specif part number, please include it with your message.